Baby gifts, Baby shower gifts, baby gift baskets, baby gift ideas. Baby gifts are special and you want yours to be unique, fun and the talk of the town. That's why we specialize in baby shower gifts, baby gift baskets and gifts for newborns and first birthdays. With so many choices, you're certain to find the perfect baby gift that will thrill both the baby and the new mom and dad. Siblings sometimes feel left out when a new baby arrives, so check out our Sibling Gifts. Great for first birthday gifts, too. Scroll down to see our sale items! 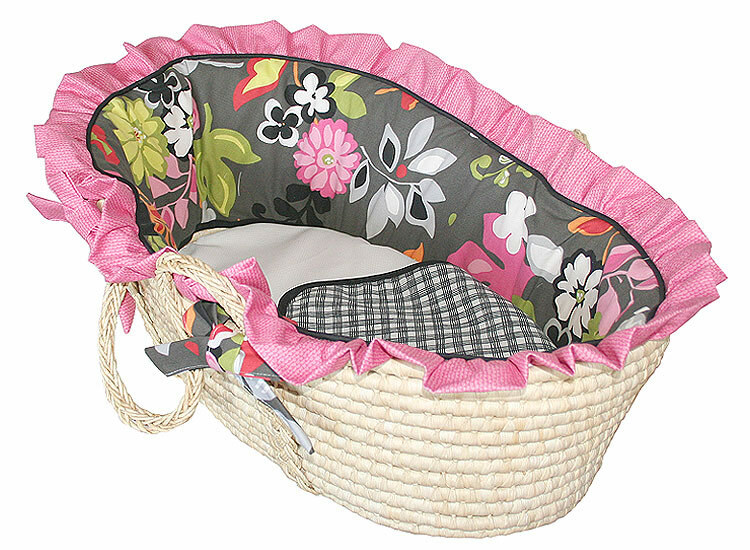 These beautiful, high quality Hoohobbers Moses Baskets are the perfect gift for a newborn. The soft fabric and cozy basket provide sweet dreams for any new baby..
"My very own folding chair I can carry anywhere" A fun and colorful addition to any "Director's" set! It also doubles as a booster seat, which is convenient for home, restaurants and even theaters. Makes a great gift! Our new "GEO" Elite Shopping Cart Cover is 'Made In The USA' - Everything down to the zippers and buckles are better quality. Safety and Comfort for Mother and Baby on the go! For children 6 months to 4 years of age. Our shopping cart and highchair covers protect your child from germs in shopping carts and restaurant highchairs. For a fun baby shower gift one of our diaper cakes may be just the thing. It makes a great centerpiece for a baby shower, too! A FREE personalized unique baby GIFT CARD is included with most orders with your special message inside. Gift wrapping is also available for many of our baby gifts. Most items ship within 24 hours. Enjoy browsing our baby shower gifts, Moses Baskets, diaper cakes and many other items. We know you will find the perfect gift. We continually add new selections, so come back often for new, creative baby gift ideas. "I received the diaper cake. It was beautiful and looks great - she is going to love it. You all did such a wonderful job!! I will use you all from now on and pass the word around that people should order from you too. Thank you so much it is perfect!! " "Thanks in advance, you have great customer service, feels like doing business with friends." Check out this great information for mom, baby and dad, too! Baby Shower Games Here is a great list of tips and games for baby showers. Complete game instructions and even a list of supplies needed for each game is provided by ChildAvenue. Find the perfect name! Is the stork making a visit to your home, or do you know someone who's expecting? This is a great place to start searching for the perfect name for your new arrival. The link is Baby Names.com. Here are some great tips on bathing your baby. Secrets to Getting It All Done You haven't washed your hair since Tuesday, your house is a mess, and your kid is out of control. How the heck do other moms pull this parenting thing off? Bookmark this site, because we are constantly adding new baby gifts and baby gift baskets.